Property owners have a responsibility to keep their property safe and fix any situations that could be dangerous. If you or a loved one has suffered severe injuries due to a property owner’s negligence, contact an experienced Anderson slip-and-fall attorney. Located in Anderson, South Carolina, the Allen and Allen Law Firm represents people throughout Anderson County and the Upstate who have been injured in slip-and-fall accidents. Founded by Chuck Allen in 1988, our firm is known for its long-standing positive reputation in the community. Before you speak with someone from the insurance company, it is important to speak with a skilled lawyer. To discuss your rights and options with Allen and Allen, call the firm at 864-226-6184. 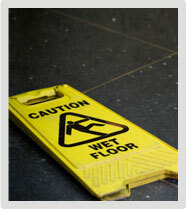 A slip-and-fall can result in serious injuries, including broken bones, neck and spine injuries, and brain injuries. When you work with our firm, Allen and Allen will thoroughly analyze the scope of your injuries and the circumstances of the accident. By approaching each case as if it were going to trial, Allen and Allen is prepared to represent you in the courtroom if needed. Rather than accept the insurance company’s settlement, we will fight to ensure you receive the maximum settlement possible to cover your past and future medical expenses and lost wages. To learn more about how our firm can help you with your slip-and-fall case or to schedule a consultation, contact us online or call 864-226-6184.